Until recently bike racing has, in technical terms, remained a poor relative of its four-wheeled counterparts. Formula One has brought its image and facilities up to modern corporate standard, supported by the major motor manufacturers. Equally the technology employed on the cars has accelerated and become more of a science than black art. Meanwhile, the lower budget bike series was largely the domain of Honda and Yamaha, where development rates were slow and utterly conventional. Under the new MotoGP banner, however, the bike series has caught up and the exciting racing and more open attitude by the teams leaves it an attractive series for fans. But how do the bikes compared to their more developed and expensive four wheeled cousins? Bikes have fundamentally different demands on them in order to make them lap around a track as fast as possible but, like the cars, they combine the need for a chassis, engine, electronics, aerodynamics and tyres. Each element has similarities and differences and in this analysis we look at each area to compare and contrast the modern MotoGP bike to a Formula One car. MotoGP is a progression of the old Grand Prix bike series. Historically this used to be a class for both two-stroke and four stroke but by the 1970s, with the demise of MV Augusta, it was exclusively for two strokes until Honda dallied in with a high-tech 500cc four-stroke. This project failed due to the complexity of the oval pistoned engine, so the two-stroke dominance continued. In the late 1990s it was renamed to MotoGP as part of re-marketing exercise and because, with only Honda, Yamaha, Suzuki and Cagiva racing in the category, very few manufacturers produced two-stroke production bikes, it was agreed to change the engine formula to four-stroke engines. Engines were categorised into the number of cylinders, which then set out the fuel tank limit and weight of the bike. This was planned to penalise multi-cylinder engines and encourage a variety of engine types. Most manufacturers opted for four-cylinder engine with a capacity just below one litre. Only Honda opted for more cylinders with an unusual V5 layout. The change to four stroke engines radically changed both the bikes and the technology that was applied to them, not to mention the different riding style required for the heavier bikes with a smoother power delivery. Gone were the peaky two-strokes that would quickly throw a rider off if he was not careful. For 2007, MotoGP has followed Formula One with a move towards smaller engines, the aim of the change being to reduce speed from the increasingly powerful one-litre engines. Therefore, from the start of this year's championship, all engines are subject to an 800cc maximum limit. Even back in the 500cc two-stroke days, technology was advancing rapidly on the bikes and electronics for managing the engine, fuel injection and chassis telemetry were in use. But the change to a more car-oriented four-stroke engine quickly brought in expertise from the four-wheeled fraternity. In the few years since the four-stroke class began it has gained admiring glances from Formula One designers. Some personnel have even moved to the category from the four-wheeled formula, the first notable transfer being Alan Jenkins, who joined the Ducati team after a long history in F1 and IndyCar. 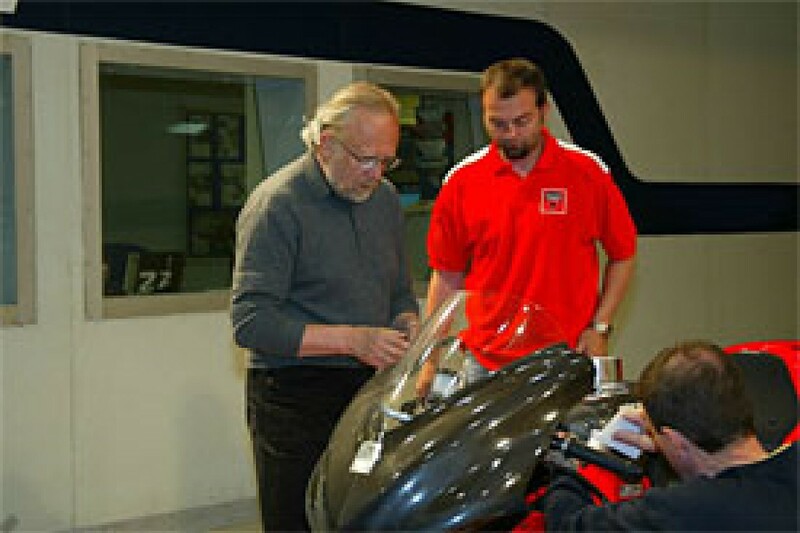 John Barnard's B3 technologies company also soon became involved in the design and manufacture of components when the innovative F1 designer linked up with Kenny Roberts' MotoGP team to apply cutting edge design to bikes. 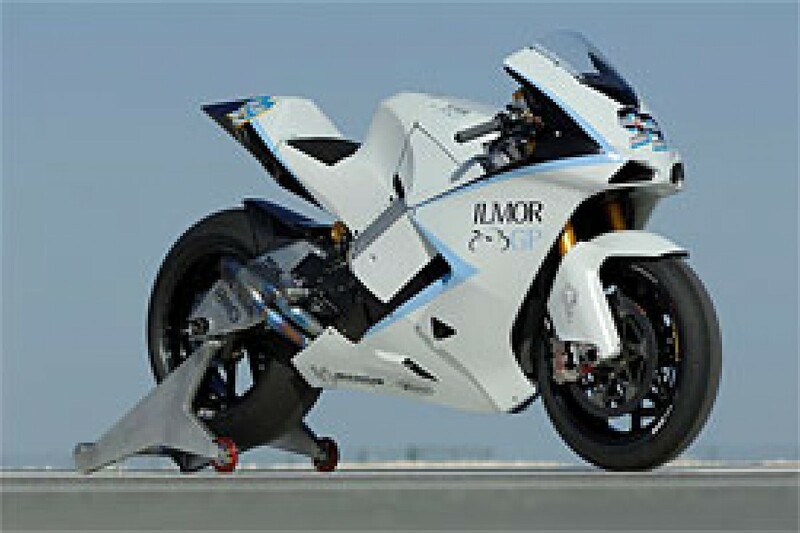 Most recently Mario Ilien, has started up a new company and Ilmor GP has developed an engine exclusively for MotoGP, the 800cc unit actually racing in 2006 as part of its development cycle with a frame developed by the respected Eskil Suter. Most of the teams involved in the sport are major bike manufacturers and consist mainly of the Japanese companies, although Ducati and Aprilia have also raced in MotoGP. With a range of manufacturers and customer bikes leased to private teams, the category is flourishing under its new banner. A benefit for the road bike manufacturers is that although the MotoGP bikes are prototypes and not based on any production parts, they are close relative of the company's road bikes. Ducatis retain the look and technology of the 999 and new 1099 road bikes with desmodromic V engines and steel frames on their race bike; Yamaha's versions of the R1 road bike echo the M1 MotoGP bike in the across-the-frame four-cylinder engine and fairing shape; and Honda take on the style of the MotoGP bike in their Fireblade range of road bikes. This adds to the marketing benefit of the series for the manufacturers, something Formula One could never emulate. It is stating the obvious to say that a MotoGP bike bears little external comparison to a Formula One car yet it is interesting to analyse the performance and handling differences between the two. At little more than two metres long and a weight of just 150Kg, the bike is markedly smaller than a car. But the bike produces far more power to its weight than even an F1 car - around 240 for the old one-litre bikes, which is 1.6 HP per Kilo compared to 1.2 for an F1 car. And a bike's method of negotiating the track is also totally different, hence its layout and technology are suited for their purpose. Yet despite the bike's very different layout and cornering method, some of the most important elements in making it go fast are similar to a car. Clearly the major difference is that the bike is dominated by its mechanical grip, while an F1 car is much more focused on aerodynamics, but there is much more in it than that. The DNA shared by a MotoGP bike and road bikes are clear to see. In fact, the racing bike's layout differs little in fundamental design from those chugging around in the early days of powered two wheelers. Its two wheels are connected by a frame which is separate to the engine, the rear wheel is suspended by a fork known as a 'swing arm' and the front wheel by two telescopic spring/dampers known as 'forks'. Of course the details of these solutions on the racing machines are an advance on road bikes, whether old or new, but the fundamentals are the same. As with cars, a bike's suspension aims to keep the wheels in best contact with the ground and reduce any disturbance to rider or chassis from bumps in the road. Unlike a car, a bike is more prone to unbalance from braking and acceleration. Wheelies might look impressive, but the power that lifts the front wheel off the ground could be more usefully used to make the bike go forward quicker. 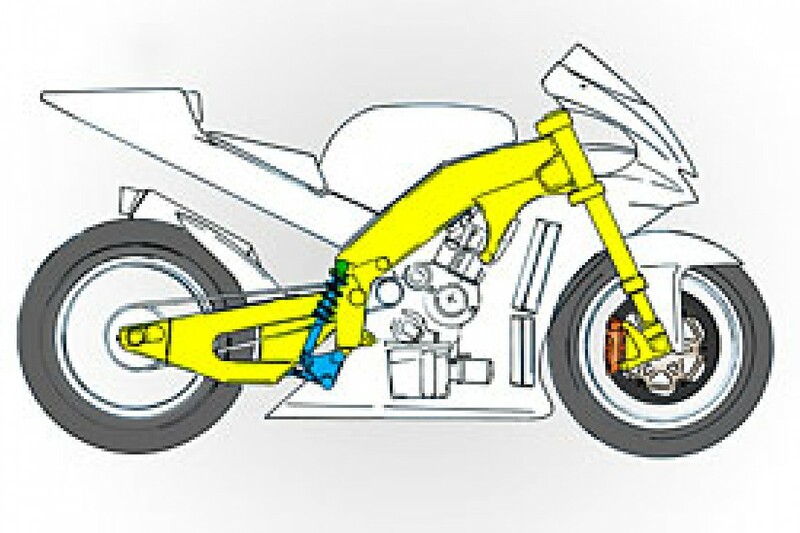 The spatial layout of the bike is aimed at creating a stable chassis under acceleration, so the swing arm is relatively long and the weight kept low and forwards to reduce wheelies and their opposite, the 'stoppie', where the rear wheel lifts under braking. One other critical thing a bike does is lean into a corner, as the bike counters the centrifugal forces of cornering. However, the suspension only works properly when the bike is upright so when it is leaning and encounters any bumps the chassis needs to twist to absorb the associated loads. This is the major deviation in terms of the structural requirement of a bike when compared to a car chassis. A bike builder cannot simply make the stiffest chassis he can to allow the suspension to work properly. Instead he has to engineer in some torsional compliance to allow the bike to remain supple when in a lean. The engineers are rapidly gaining a greater understanding of this requirement. Frames tend to be a twin beam design, fabricated from aluminium sheet. From the swing arm pivot to the tube mounting the forks, the frame wraps around each side of the engine, making it is very stiff so as to resist the longitudinal forces but not the torsional forces. Carbon Fibre has not been used as a frame material in MotoGP - Cagiva raced with Carbon frames and swing arms in the 500cc series but they found they were too stiff, which compromised the bikes handling through corners. 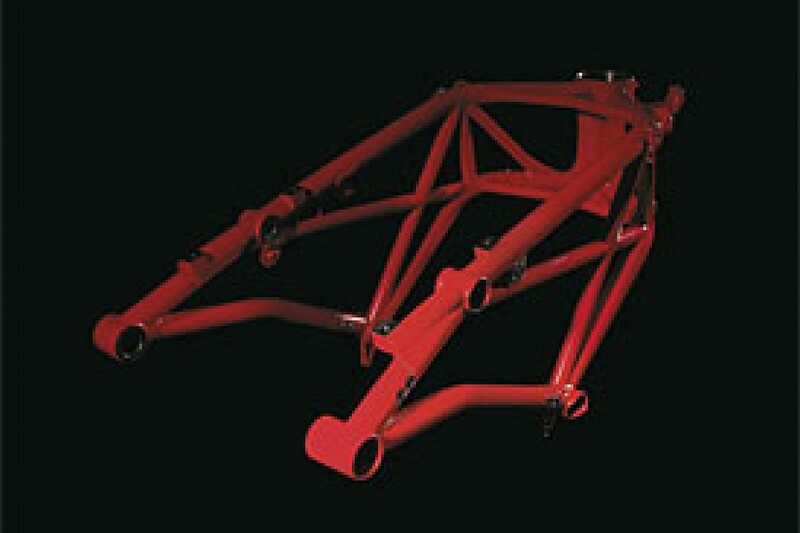 Ducati are the exception to the aluminium frame, as they use a similar steel tube trellis to that used on their road bikes. This looks very different to the aluminium counterparts but is in fact very similar in its method of wrapping around the engine to interconnect the forks and swing arm. The sprung element of the suspension is managed at the rear by the swing arm operating a linkage on a damper with a coil spring. Thus the damper can have a longer stroke than wheel travel and also have a rising spring rate. The damper itself is very special piece of hardware with valving controlling the spring even when hot. Some riders have adjusters on the handlebar to alter the damper as the fuel load lightens. At the front, the telescopic forks appear very similar to those on any road bike. MotoGP bikes use the 'upside down' format of fork, that is the steel stanchion is attached to the wheel rather than the yokes (triple clamps) and this places the weight lower down making it stiffer than 'right way up' forks. Inside the forks there is a coil spring and also a damper cartridge to control the spring. Of course the materials used are different from those seen on road bikes, with surface treatments used to keep the stanchion from binding under braking. Brakes are one of the few components supplied by the same companies that supply F1 and are commonly bought in from AP and Brembo, although Honda are also supplied by Nissin. When a bike brakes, most of the weight transfers to the front wheel, so the front brakes are much larger than the minuscule rear brake. The rear brake is used largely for balancing the bike and is controlled by a foot lever (although some injured riders use a handlebar-mounted lever). The front brakes use two large diameter discs bolted to the front wheel and these are gripped by two six piston callipers bolted to the forks. The use of Carbon discs is largely for their lightness - metal discs have a greater gyroscopic effect and affect the bikes handling - but they have needed some development to ensure they work well at low temperatures and can also be kept at the ideal running temperature without the complex ducts and covers seen in cooling Formula One brakes. Another element in braking comes from the engine when the rider changes down through the gears and uses the friction within the engine to help brake the rear wheel. But having come from two stroke engines with little engine braking, the riders were unused the heavy drag placed on the rear wheel into corners so engineers have found a number of solutions. The first of these is the clutch. A slipper clutch is used, and this locks up under acceleration but is allowed to slip under deceleration, therefore placing less drag on the rear wheel. Secondly, engine management is used to keep the engine alive on a closed throttle, again reducing the drag the engine creates on the overrun. Despite the work carried out, the riders can often be seen with a rear wheel on the verge of a lock-up into corners. This sees the rear wheel tend to try to overtake the front wheel. This sliding looks dramatic and is a sign that the rider is pushing hard. The effect is known as 'backing it into corner' and rarely causes anything more than the rider overshooting his corner entry. The heart of the MotoGP bike is its engine and gearbox. Weighing in at around 55kg complete, one third smaller than F1 engines, the new 800cc engines all now use four cylinders but the layout of the cylinders varies between each team. Yamaha and Kawasaki use an across the frame format, which puts the four cylinders in a line from left to right across the bike and is wider but shorter than a V format. Both teams use this format as it conforms to their road bikes while other teams adopt a V format, which in itself varies in layout. Honda's 800cc V4 is a new engine, Ducati again employ a V4 format but it is more akin to the road bikes with the V of the cylinders canted forwards. The other critical factor for a MotoGP engine is how it fires its cylinders. This may have eased slightly with the smaller 2007 engines, but MotoGP bikes can have a sharper power delivery than the rear tyre can cope with so the way in which the engine delivers its power is critical. Teams have resorted to running with less peak power than would otherwise be possible in order to get a better power delivery. One method of achieving this has been to make the bike fire more like a twin than the four-cylinder engine. This is known as a 'big bang' engine, where pairs of cylinders fire simultaneously or slightly offset to break up the power stroke into distinct steps rather than a continuous stream as seen on multi-cylinder engines. This design has the effect of gaining better traction from the rear tyre, and there are two theories as to how this is possible. One is that the 'big bang' engines have inherently broader power bands, the other that the breaks in power allow the rear tyre to regain traction momentarily. As the four-stroke formula has evolved all the teams have played with crank timing to find better traction. Equally, the direction in which the crank spins in is a decisive factor. At high revs on such a light motorbike, the crank's rotational inertia can actually lift the front wheel off the ground or at least reduce its grip. Teams have reversed their crank rotations to have the opposite effect. Unlike F1 cars but like road bikes the crankcase is cast with the gearbox in one piece, thus the unit is strong and does provide some stiffness to the frame. The cylinders tend to cast with the crank case, leaving the to removable cylinder heads cast as one bank, i.e. one for an across-the-frame four and two heads for a V4. Four- and five-valve heads have been tried but four valves arranged radially around the combustion chamber now appear to be favoured by all. With Revs now nearing 18,000rpm, valves are, surprisingly, most often controlled by valve springs, a technology abandoned in F1 since revs rose too high. The New Ilmor bike has adopted pneumatic valve springs, as had the Cosworth developed Aprilia engine, and as the valves are lighter than they are in F1, the manufacturers are confident in this technology. Again the exception is Ducati, who employ their famed desmodromic valve closing mechanism. Instead of valve springs, there is a second cam profile that operates a finger that positively closes the valve. This keeps the valve timing very accurate despite the complexity. MotoGP engines are wet sump, which means that oil is allowed to pass through the engine and is collected in a deep sump attached to the bottom of the crankcase. These sumps need to allow clearance for the exhausts to pass under the bike. 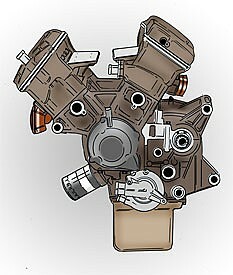 The Honda V5 engine pictured shows the extreme compactness of the unit. Note also how the engine's weight is centralised - it is a key theme for the teams to move all the major masses as close to a central point as possible, keeping the bike nimble by reducing its moment of inertia. This is different to racing cars, where the aim is to have the weight as low as possible. Equally the ancillaries around the engine are mounted to locate mass as close to the centre of the bike as possible. 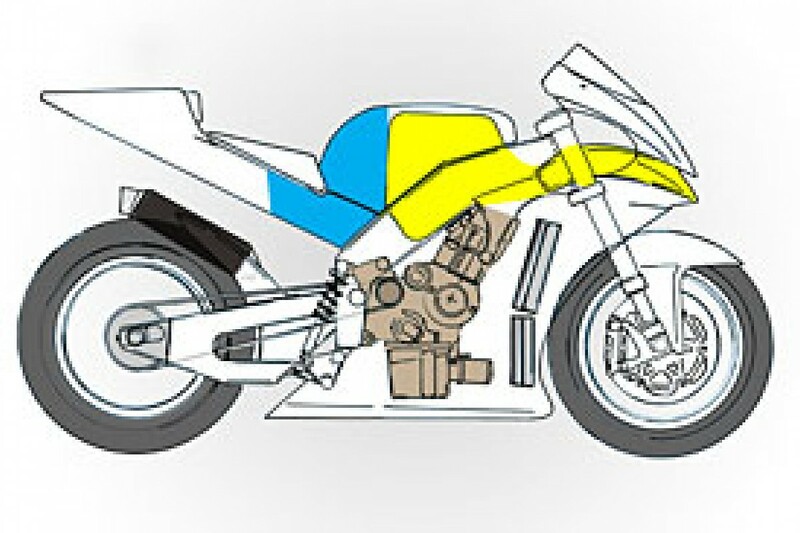 The fuel tank is dropped back behind the engine, with a large part of its capacity under the seat (blue in the engine illustration). The space high up where the fuel tank used to be is now used by the lighter air box (yellow) which is fed from a duct passing through the frame from the nose of the fairing. Lastly, exhaust routing is a problem for the designers as the pipes need to allow space for the central packaging of the fuel and engine, but also clear the frame and swing arm. Because of this, the across-the-frame four-cylinder bikes route the exhaust under the engine and up the side of the swing arm. V4 engines tend to route one set straight out of the back of the seat unit and one set under the bike. Unlike F1, silencers are often fitted to the bikes, not so much to reduce noise but to create back pressure for more efficient mid range power...their inability to suppress noise is obvious for anyone who's been near track when these bikes are running! Just as in F1, tyres can make or break a bike's competitiveness. Three suppliers feed the teams with the required rubber, but the contracts with each team provide different levels of parity. Works teams will get the bespoke tyres and the lion's share of tyre testing while teams with leased bikes will get a second string supply, not always being able to be supplied with the best tyre and in the right sizes. In a similar method to the F1 tyre supply, the teams get a choice of compounds from soft to hard and these are quite openly published after the race has begun, as there are no pit stops in MotoGP. In F1, all teams use the same sized wheels and hence the same sizes of tyres and the profile of the tyres is effectively fixed in aspect ratio and shape (i.e. a flat tread). In MotoGP, the teams can run different diameter and width wheels. As with the crankshaft, the gyroscopic of the wheel has a large effect on the bikes handling, so there is a tendency towards smaller diameter wheels. The current fashion is the 16.5 inch wheel, which is a compromise between the usual 16" and 17" wheels. It was found that the revised wheel size gave a better profile shape (the rounded tyre profile when seen from ahead). No longer simply rounded, the latest range of tyres creates a subtle three-edged tread, one for when the bike is upright and one each side for when the bike is leant over. In order to keep up corner speed, the four-stroke MotoGP bikes needed to put their power on earlier out of the corner and hence need the side of the tread to provide grip. The new tyre profiles, compounds and constructions have made the bikes faster than ever before. Even when the tyres are going off in the race they can still provide progressive grip, even if the actual total grip is now so low that the riders are able to spin and smoke the tyres dramatically out of the corner. The need to control the immense power available form the four stroke engines has introduced electronics into MotoGP and this move to ever more complicated engine management systems has brought the opportunity for 'rider' aids. When the first batch of four-stroke engines was developed the designers employed a lot of car-style control systems, thinking that the solutions would migrate easily to two wheels. Up to this point the 500cc two-stroke MotoGP engines were running carburettors and simple throttle cables. This meant the response of the bike from the rider's inputs was slow but predictable. Far from being a negative, this was useful as the riders needed absolute confidence that the bike would react the same on a lap-by-lap basis. When the fly-by-wire throttles, traction control and fuel injection systems were run on the four-strokes, the riders found they were unexpectedly having control taken from them at different points on each lap, something which knocked their confidence. Some of the systems were dropped while more subtle solutions were worked out. Now many teams have systems to manage traction and wheelies, launch control and even the artificiality of a drive wire throttle is being raced. For the latter Yamaha had to have two cylinders under the rider's control and two under the fly-by-wire control to make the system feel natural. Gear selection is still completed manually by a foot lever through a sequential gearbox. Ducati have played with a semi-automatic gearbox, but again the system proved unreliable and unpredictable leading to a major crash for the team's star rider. No doubt, in the future, electronics will be even more greatly developed and a new breed of riders may be more comfortable with the aids and development will make them more predictable. Despite MotoGP bikes being as fast as F1 cars in a straight line, they are not as aerodynamically dominated as their four-wheeled friends. There are fairly restrictive bodywork rules in MotoGP and a sense of conventionality by the manufacturers - but then bikes are very hard to assess aerodynamically. Firstly, the bike is not always upright; in fact when aero grip is needed, the bike is almost definitely leant into to a corner. Equally, the rider forms a large part of the bike's aerodynamics. If he isn't sat in the same position, or in the same leathers, then the results will differ each time. So without being able to create any meaningful downforce, the teams have to work on the two remaining aero demands for the bike, those of straight-line drag and susceptibility to cross winds. A bike's bodywork is made up of only a few pieces; the main fairing, the front mudguard (fender), the seat/tail unit and the rear mudguard. Most effort is put into the upstream bodywork, being the fairing and mudguard, as the bodywork downstream of these is so hindered by the rider and other parts that it does not contribute to the aero efficiency. The fairing has to feed air into the radiators and the airbox, as well as pass air cleanly over the rider. The various inlets and outlets are much more efficient nowadays as a result of wind tunnel work, but the main aim of the fairing is to reduce drag on the straights. One would intuitively feel that making a long sleek all enveloping bodywork would be the best method, but such a large expanse of bodywork compromises the other area of aero development, side winds. 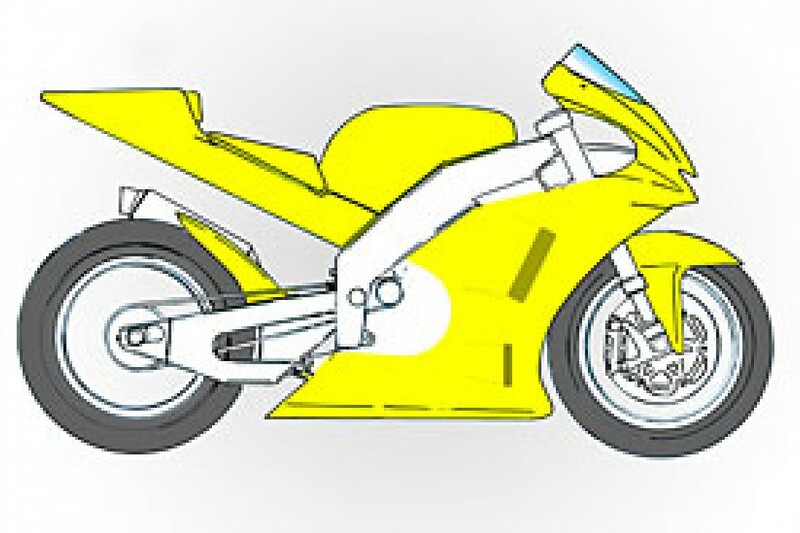 These come from two sources: when the bike suddenly leans into a corner the roll it is slowed by the air pressure on the side of bodywork, which makes the bike less nimble, and when the bike is flat out it is buffeted on the straight by side winds, which is very unsettling for the rider. Thus the side area of the bike needs to be smaller or more rounded. One old approach to this was to drill the fairing with hundreds of small holes, a method that relieved side pressure but was not a proper cure. Now bikes are tested at an angle to the flow in the wind tunnel to assess their stability, but as yet the science is at an early stage. That is not to mention the manufacturers desire to make the bike look good and match any similar models in their road bike range. Often the fairing has some styling touches to match the road bike and the majority of the bike's identity is placed in the less sensitive area, the seat unit. Conversely Honda this year have made their RCV212 appear almost like a 'street fighter' with its cut back fairing and short tail unit. Unlike F1, it seems MotoGP can make attractive bikes that are competitive. Despite still being based on a layout dating back nearly one hundred years, bikes are now highly technologically advanced. The recent input from the automotive world has rapidly developed areas such as electronics, aerodynamics and design software in the world of two-wheeled racing. With this crossover MotoGP will soon catch up with F1 in technical terms. Whether this will have a negative effect on cost and the racing in the future is something that will need to be seriously monitored. But, right now, this year's 800cc formula promises new bikes from the existing manufacturers plus one from Ilmor. The detail of each of the bikes is amazing and progress will be rapid and worth monitoring through the year.